Full disclosure: I am not a fan of re-posting old posts. I accept that others do it, and I understand the reasoning behind re-posting old posts; however, I prefer to read and write new stuff. That said, I linked to an old post of mine earlier this week, and I am getting ready to re-post something I wrote in February 2010. So, which post am I sharing with you for a second time? Well, after debating between two, I chose this one, because I think it fits with the coming resolutions for the new year. Consider this a reminder that something needs time to ‘stick’ before change can happen. The junk drawer is filled with many odds and ends, like miscellaneous adapters, tape, nails, cereal box toys and a small bottle of Elmer’s glue. Last night, while talking to my husband, I realized the turning around of my life and marriage could learn a thing or two from Elmer’s Glue. When you glue something using Elmer’s glue, you have to be careful with what is being glued until the glue dries completely. If you try to move it too quickly, the glue doesn’t have a chance to hold itself in place. You need to be patient and let the glue work; you need to allow enough time for it to stick. Well, the same holds true with change and with expectations. I want my marriage to change. I want my marriage to work. However, we’ve been in a dysfunctional state for so many years, I can’t expect the change to occur instantly. Though I feel better and better each day about myself and the world around me, I shouldn’t get ahead of myself and try moving things around before the glue has a chance to work. As I have said in a previous post or two, sometimes my mind gets manic. Various thoughts pop in and out of my head, and I often want to act on the thoughts instantly. I want to act on it before it has a chance to stick. I feel good. I’m ready to move forward. So, let’s move forward already. Oh wait. I see the glue in the junk drawer. If I move forward too quickly before the glue dries, I might slip and endanger the progress that has been made. Yes. Last night, while talking to my husband, I realized I may be expecting too much too soon. We’ve been in a dysfunctional state for about 5yrs. And, we’ve had moments in those 5yrs where we thought things were turning around for us, only to find things got worse. If one doesn’t learn from mistakes, s/he risks making the mistakes over and over again. Thanks to the glue I found in the junk drawer, I am reminded that things need time to stick before you can move to the next step. My husband and I have recently put the glue down on our relationship. Rather than getting caught up with what I think we should be doing NOW, since the glue was laid, I need to sit back and wait. I need to be patient. I need to let the glue dry. And, perhaps I can start prepping for the next step without actually taking the next step. I wonder what else I find in the junk drawer. *Originally posted on February 2, 2010. The good thing about reposting is, most readers haven’t been with a blogger since the very beginning, and life is too busy to spend all of our time searching someone’s archives. Besides, that may be seen as creepy. So thank you for reposting this so I could read it. Very thought provoking! I hope the glue has dried in the way you want it to. True, Peg. Your point is valid, and I hear you. Thank you for reading my post, and I am glad you found it thought provoking. I started this blog as a last ditch effort to save myself and my marriage. I am happy to report the glue dried – and the marriage is solid. I agree with Peg…not everyone has seen this post, including me! Do you have a followup post to let us know how the glue is drying? Thank you, Wendy. Peg made a great point. With regards to a follow-up post … I don’t know if I have one specific one. Happily, as I said to Peg, the glue dried – solidifying the marriage. Thank again for visiting, Wendy. Glad you enjoyed the repeat. I loved this post and I’m happy you’ve decided to repost it. Now I’m with Wendy, is there a part 2? Thank you, Darla. There may be a part 2 buried in the archives somewhere. Suffice it to say, Rob and I are solid. We’ve come a long way since February 2010. I’ve come a long way. Yeah us! Yeah me! Holy Moly that’s amazing! Such sage advice LD!! You must remember this when the boys are older or if someone starting out needs wise words from someone who has been there/done that. It reminds me of looking back on Noah’s first year of life and thinking, “I wish I had just set back and watched him grow rather than encouraging him to roll over, sit, crawl, etc.” I always figured I’d enjoy my second baby in a whole different way. Then I didn’t have that second baby. My second marriage is the same way. I’m calmer with Hot Joe. I don’t expect as much but I give more – and I get much MUCH more. I see the future and it’s long and it can wait. I’m so glad you chose this to repost. I’m so glad I stalk you. I just hope you don’t go jumping off bridges. Isn’t it wonderful to see a happy future ahead? Man, sure beats the view I had just a few years ago. Here’s to letting the glue have time to stick, Kim. I hadn’t seen this post when you originally posted it, so I’m glad I had the opportunity to read it. And it comes at a great time as I really need a reminder to slow down and let the glue dry. So often as soon as I make a decision, I want it to all happen “right now.” Thanks for the good advice. Thank you, Jacquelin. I am glad you liked this post. Once again, I find myself looking at something differently. Re-posting can be a very good thing. Here’s to you finding the patience in letting things stick. Go out and get a small thing of Elmer’s Glue and keep it out where you can see it. Thank you for visiting. Hello, AA! Thank you for visiting. I am glad you liked the post. It is nice to read the post and see how far my husband and I have come. Glue is a wonderful thing! Thanks again for stopping by my neighborhood. 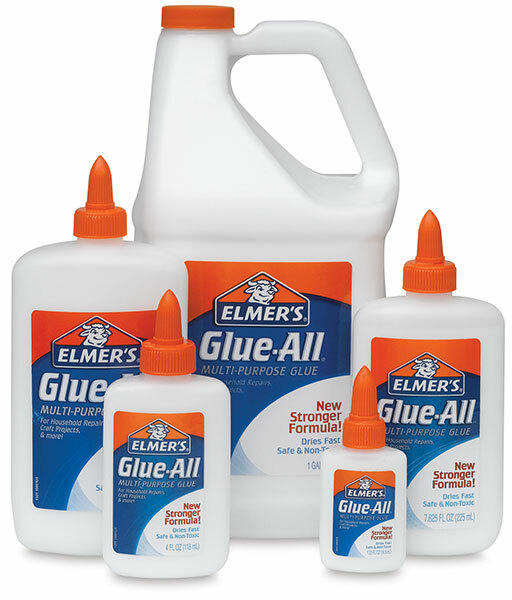 Elmer’s glue is all milky white when it comes out of the bottle; then, it turns clear when it dries, not transparent but relatively clear. So if things are bright in your future, sounds like your glue is drying clear(ly)? Georgette! I love what you said about it drying clear. Yes! And, yes, our glue is drying clearly. You are so smart! Thanks, Bridget. I liked your pun, too! Yes, thanks for reposting because I never saw it the first time around. It’s a great piece of advice and I hope it the glue is mending for you. Thank you, Linda. I am glad I reposted this, too. It seems to resonate with many people, which is one reason why I started writing when things weren’t so rosy. I assumed I wasn’t alone and others could relate. And yes – the glue is mending. We have come so very far. Life is good. and I’m not just saying that because I’m a fan of glue. Although I did not eat Elmer’s Paste as a child. That I continue to deny. You say you do not do the word thing well – but you do. Thank you for visiting. I’m so glad you re-posted that one. I don’t think I’d discovered you yet. Wow! What a fantastic analogy. And what mature thinking. So glad it’s working out for you. Elmer’s glue works wonders, M2M – provided you remember to let it dry. (I still goof on that sometimes. (smile)) Thanks for visiting. It is good to see you.